The Animal Feeding team recognizes that feed is a key issue for livestock productivity and its costs are rising all the time. The Animal Health team seeks the prioritization of Animal Health (AH) constraints to inform technology development, animal health service delivery and to contribute to an animal health policy framework. The Genetics & Breeding team whose overall objective is to develop and promote breeding strategies and interventions that sustainably improve animal productivity in emerging smallholder market-oriented livestock production systems. Currently, huge gaps exist between potential and realized productivity. Are cows the next development boom for smallholder farmers in Zimbabwe? As world population increases in tandem with our demands, the land on which we depend to feed ourselves remains constant and in many areas, rain is decreasing. Livestock are central to the livelihoods of some one billion of the world’s poorest people, some of who sell livestock products, trade in manure, get jobs in the dairy industry, to mention but a few. 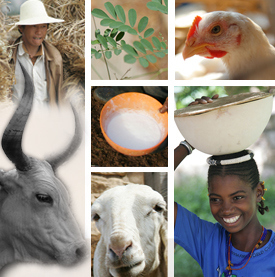 Livestock also provide nourishing foods for poor households in urban as well as rural areas. A major challenge is to meet that demand using the same resource base without depleting the environment.